Not a club anyone wants to be in and thank goodness I am no longer an active member but now relegated to associate member. Can you believe that the song playing in the radiation room on my last day of treatment was by Queen. The song that became my Breast Cancer Signature tune, the song that my husband and I danced to back in March after the results from my lumpectomy came back. I guess now I can say I kicked your shitcan and you got mud on your face. I am now cancer free and in remission. Going in the morning for radiation was a much better option for me. My energy level was higher after a good nights sleep. I could get it over and done with and then go out with friends, have lunch and then come home, rest, and then spend a couple of hours in the studio. I had no time to fall into the rabbit hole of despair or self pity or give in to the fatigue (thank you my dear friends). The 30 minute commute was pretty easygoing, no fighting traffic, no standing at bus stops or fighting grumpy subway commuters. The hospital, Miami Valley Hospital South, and the staff were lovely. I could tell there was a great deal of thought and attention to providing a comforting experience for patients which included well tended landscaping, nice decor/waiting areas, and art on the hospital walls. Not overly cheery, but pleasant and calming. 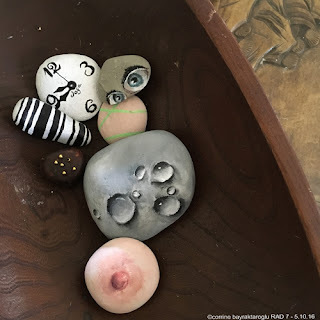 While my creative need isn't related to trying to reduce stress or as a form of therapy, painting a stone each day of treatment was something I looked forward to. It was the one thing I could do that I had control over and a time that helped keep me focused and centered. There were a couple of times I had no clue what I would paint and almost panicked. That's when I would tell myself NOT to overthink it and that whatever was meant to be on a stone would reveal itself, which it did. You can see the full slide show on the link under the photo. 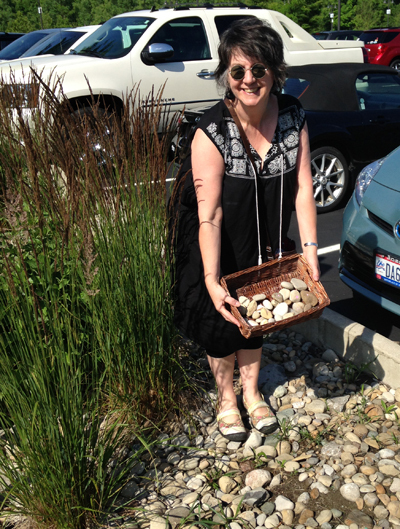 My final act after treatment was to do a "ceremonial dumping of the stones" and for each stone I took from the hospital landscaping I replaced with a stone I found from my garden. Whether you're Van Gogh or a stick-figure sketcher, a new Drexel University study found that making art can significantly reduce stress-related hormones in your body. Although the researchers from Drexel's College of Nursing and Health Professions believed that past experience in creating art might amplify the activity's stress-reducing effects, their study found that everyone seems to benefit equally.